A council beach sign sparked a few chuckles after stating dogs were banned until September 31, despite the month only having 30 days. 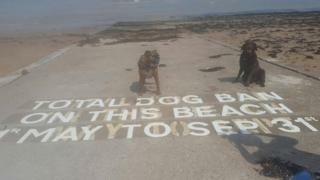 Thanet District Council has a dog ban on part of the beach in Walpole Bay for the duration of the summer. The error, spotted by a couple of regular dog walkers on Wednesday, was made by the contractors who painted it on the ground, the council said. It confirmed the mistake had now been corrected. Dog walker Sally Waterfall said: "I was with a friend at the time and walked down to use the dog bin, and that's when I saw the sign. We just thought it was funny. "It's been done in the past couple of days." The original beach signs painted last August were starting to fade, and at least two were repainted with the incorrect date. It caused a stir when Miss Waterfall uploaded a picture to the local Thanet Animal Lovers Chat Facebook group, and others soon commented, laughed and added snaps of their own. "People initially asked me if it was Photoshopped because it actually looks fake," she added.